Though overshadowed by the release of the far more opulent Down to Earth remake Xanadu a year later in 1980, this largely overlooked roller disco time capsule starring a fresh-faced (and refreshingly exorcism free) Linda Blair has been building up momentum as a cult favorite over the past thirty years. An upbeat time-waster that perhaps plays best in the background of '80s night at the roller rink, in 2006 Roller Boogie was given an unconventional re-release playing in New York based American Apparel stores. As colorful and instantly forgettable as a piece of bubblegum, Roller Boogie makes very little sense from one illogical scene to the next. Ostensibly a wrong side of the tracks summer romance in which its two skating obsessed teens fall in love while preparing for the titular contest, the film merges multiple plot strands together in the hopes that something will stick with us for longer than the length of a skate down the boardwalk. While a sequel tentatively planned to be set in Acapulco disintegrated at the end of the disco era, the late 1979 release of Roller Boogie proved popular with teen audiences, netting Compass International Pictures a modest success following their breakthrough smash Halloween from director John Carpenter a year earlier. Bolstered by the four-wheeled acrobatics by legendary skater Jim Bray who turned pro after accumulating more than two hundred and fifty trophies at the age of eighteen to star in this – his only – film, while Bray's chemistry with Blair is never quite convincing as anything more than just pals, the two give it everything they've got in several jaw-dropping numbers. Though doubled for some of the picture's toughest tricks, in a far cry from the drama that followed Jennifer Beals a few years later in her stand-in heavy Flashdance performance, Boogie's Blair did most of her own skating here. Gamely braving hip bursitis in addition to bumps and bruises, Linda Blair makes a genuinely likeable leading lady – Boogieing her way into our hearts from start to finish, in spite of the film's terribly inconsistent screenplay. Showing a flair for lighter material and physical humor, while Blair would eventually return to the horror genre that launched her in the following decade, looking back at Roller Boogie today, you can't help but wonder how great she would've been in a female buddy picture opposite other talented young stars of the era, had the right material been available to her at the right time. Listed as one of the one hundred most enjoyable bad movies in The Official Razzie Movie Guide by Golden Raspberry Award founder John Wilson, although Roller Boogie's largely bravura roller choreography manages to distract us from the threadbare script and one-dimensional characters, ultimately it's not enough to keep our attentions from wandering throughout. And while I normally frown at remakes, seeing this a mere week after I was sent a retro Disney Channel Original Movie set in the world of '60s surf musicals made me think that a complete rehaul and rewrite could be exactly what Roller Boogie needs to fully capitalize on the promising hybrid of a skate/dance film. Operating on a lower budget than the over-the-top Xanadu, Roller Boogie was filmed over the course of a breakneck eight week shooting schedule, which is all the more impressive considering the complexity of a penultimate chase scene on skates. Lensed in a dizzying dance style filled with the quick cuts that would soon become the norm with the birth of MTV, Roller Boogie is filled with largely original pop music written by Bob Esty and Michelle Aller from start to finish including Cher's catchy "Hell on Wheels" track that kicks off the movie while simultaneously setting its breezy tone. Needlessly raising the stakes by way of an ill-advised Scooby-Dooish crime plot which tasks the kids with stopping evil mobsters from seizing control of their beloved roller rink before the big roller boogie contest, Roller Boogie takes a few too many detours on its way to the final skate. Better served as a stylish, straightforward summer romance, the film winds up giving off the impression that we're watching four totally different movies play out at the exact same time (with each one missing a few crucial scenes). Changing tempo quickly and picking up momentum with speed, Boogie works best the faster it goes, balancing plots strands, new characters, and disco balls on the skates of its capable cast. Better served both as a collection of scenes and when it lets the music and visuals take center stage in place of the often cringe-worthy dialogue, Boogie's editors keep things moving before it all falls apart completely. Even if today it's the one in greater need of a remake, ultimately Roller Boogie gives us a more authentic view of the roller disco era than the grandiose '40s musical inspired Xanadu which skyrocketed it even faster to cult success. 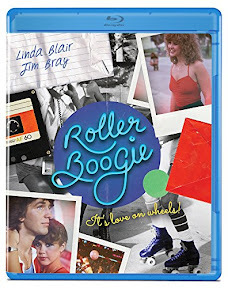 And while it does show its age both in close up and in wide shots, thanks to the largely grain and debris free transfer to Blu-ray high-definition from Olive Films, we're reintroduced to 1979 all over again with a new Roller Boogie release that makes it shine brighter than the California sunlight.